You are here: Home / Action Alert / RuFES Resolution: Save Strong All Year Long! The new year is now well underway, but families and communities everywhere are still setting goals for what they hope to accomplish in 2013. 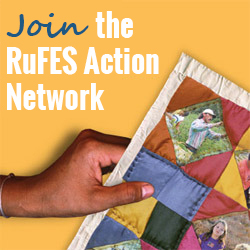 We here at RuFES have set the bar high once again, as we continue to work toward all 28 of our family-focused goals to help hard-working rural families get ahead in life. We’re kicking the year into higher gear with this important goal: helping rural families save more. Savings can help rural families avoid getting derailed when life’s unexpected events throw them off track. Most importantly, savings provide the base to Grow It – to move families into the economic mainstream over the long-run. Read on for ways you can help rural families develop and follow through with savings goals this year. Want to help rural families save more in 2013? Register for CFED’s January 25th webinar: Finding “Ready” Savers: Innovative Recruitment Strategies to Increase Program Completion. Webinar participants will hear from three Assets for Independence (AFI) grantees who have developed effective recruitment strategies for IDA programs, or who have made “course corrections” along the way that have helped them reduce attrition. A new AFI Tool for Success will also be featured that identifies program recruitment tips you can use to pinpoint savers who are more likely to successfully graduate from your IDA program. While this webinar was designed with IDA programs in mind, the tools and strategies highlighted will likely be relevant to other savings programs for families. The webinar will run from 3:30-4:30pm EST this Friday, January 25. Click here for details and to reserve your spot NOW! Sign up for America Saves Week and encourage others in your community to join! America Saves Week, held February 25-March 2, 2013, is an annual opportunity for organizations to promote good savings behavior and encourage individuals and families to assess their own saving status. A wide variety of participating organizations – from government agencies to employers to educational institutions – have already signed up and are using the free online toolkit to connect with residents and promote savings in their communities. In 2011, about one-third of financial institutions surveyed reported that they had an increase in the number of accounts opened during America Saves Week, showing the potential impact participating organizations can make in just one week! Click here to register your organization and download free resources to boost saving in your community! Encourage families to participate in the SaveYourRefund Sweepstakes! Doorways to Dreams Fund (D2D) is launching a nationwide sweepstakes this tax season to motivate families to save part of their tax refund. February 1st through April 15th, taxpayers who elect to save as little as $50 of their federal tax refund can enter to win $250 in weekly drawings or a grand prize of $25,000. Click here to register for a 30-minute informational webinar about the sweepstakes on January 25th, January 31st, or February 8th. You can also download free outreach materials here. Check out this recent paper from the Heritage Foundation that profiles innovative programs that encourage saving among low-income populations. The report highlights a number of savings programs in the U.S. and abroad, including Michigan’s Save to Win program that uses a lottery to incentivize saving, and Super Saver CDs, a product that many credit unions are using to help customers follow through on savings goals.